Anyways, the Muse, another consumer grade EEG, is supposed to have an electrode setup that supports frontal EEG asymmetry which can be used to infer valence: whether you feel positive or negative. I’ve previously used an Enobio EEG headset to perform frontal EEG asymmetry as part of an “interest” inference engine, but as a research grade device it’s pretty pricey. A single EEG channel headset, like the MindBand, is only really good for inferring muscle activity e.g. eye blinks, and mental workload; valence only requires an additional channel of EEG to work and allows you create so many new different types of interactive experience. As such it was only a matter of time before a consumer grade device was made to support the necessary electrode setup. Over the weekend I got a chance to play around with the Muse and unfortunately I didn’t have the greatest of experiences. The device has a similar form factor to the MindBand, in that it’s designed to be worn like a head band. Unlike the MindBand the Muse is a single piece of hardware which houses all the electrodes, electrode mount and the electronics. The device is light, looks nice and is comfortable to wear, but there’s a problem, the electrodes on the ear are designed with comfort and not signal quality in mind. As you can see in the image above, the Muse uses a rubber ear rest in order to fit the device on the wearer’s head. As the rubber is flexible it’s quite comfortable to wear. Around each of the rubber ear rests is a thin metal band that goes around both sides of the headset. This presumably houses the reference electrode and in order for the device to work these electrodes must have a good connection to the surface of the skin, either the side of the ear and/or head, otherwise the EEG signal will be noisy. 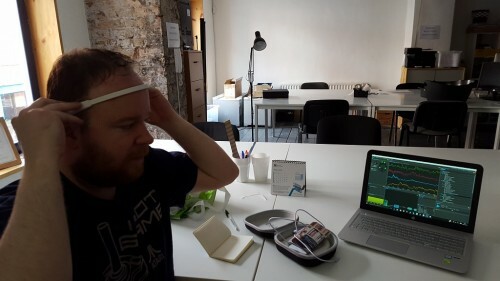 Unfortunately, wearing the Muse as I’m expected to wear it didn’t provide for a good connection and it was only after applying pressure to my ears to close the space between the metal band and the surface of my skin was I able to get a usable EEG signal, as can be seen below. This is obviously less than ideal. Other consumer headsets I’ve tried (e.g. most of the NeuroSky family: MindBand, Mindset, Mindwave) it takes me under a minute to put the device on and get a signal going. 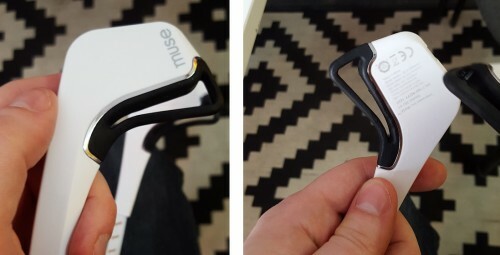 It would have been preferable if the Muse had a similar design to the MindBand and the entire ear rest was metal to ensure a good signal. As is, your rather reliant on the shape of your ears being a good fit for the Muse otherwise you’ll need conductive gel to ensure a good connection. I’ll probably get the Muse at some later date just because of the electrode setup, but my experience with the signal quality was a disappointment. It’s just a shame I encountered this problem straight off the bat as it looked like a great piece of tech. What are your experiences with the Muse, did you have any problems with the signal quality and if so how did you go about addressing it? I’d be interested to know in the comments. I have a Muse, one thing that works for me is to put the headband on and then just wait a few minutes for the signal to kick in. Basically I think ears are pretty bony and if you wait for some sweat to build up it helps with the connection. I use Muse just with the free app and when I put headband on a few minutes before going into a meditation, then I don’t have any issues. The silicone ear parts are actually conductive, it’s not just the metal piece, if you just let it sit on your ears that might help. Thanks for the tip Joshua! Didn’t know the rubber was conductive. Disappointing then that the greater surface area didn’t help improve the signal quality without me applying pressure to the ear electrodes. Hopefully the next time I get to play with the Muse I’ll have better luck.